If you've been hopping along, you should have arrived from the one and only Jennifer McGuire's blog. Your next stop after this will be Laurie Willison. The entire hop list can be found later in this post. This release had my mind just dancing with ideas, and the cards kept a coming! I'm sharing four cards today, so if you don't already have a cuppa something awesome by your side, you might want to go grab a cup to enjoy while I share my makes. 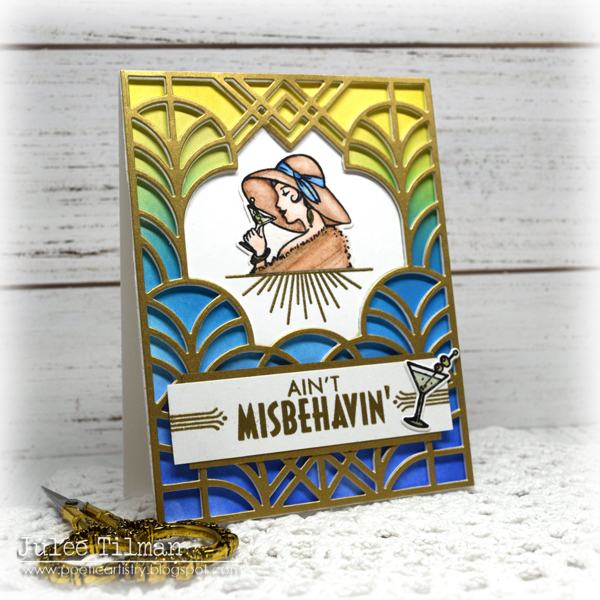 While it's hard to pick a favorite, Little Miss Misbehavin ranks pretty high in my book! I stamped her on watercolor paper and then colored with NeoColor II Watersoluble Crayons. Haven't used them in quite some time and it was fun trying to get a little striation on her fur stole. Asked my hubby what color a martini was after I had colored it and he said clear. 👀 But then he looked at my coloring and said I could just call it an apple-tini! Haha! Whatever it is, it looks like she's enjoying it! I then embossed the accent in gold on the negative of the fancy die included in the set and added her just above it. For the background I did a little ink blending with twisted citron, salty ocean and blueprint sketch distress oxides on smooth bristol. I layered the fancy die from the kit cut from the gold shimmer cardstock from the December MMH kit, then on a white foam sheet for dimension. I inserted my stamped focal piece, then glued it all down. 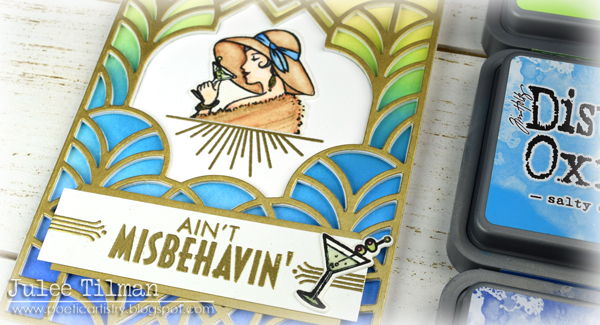 For the sentiment, I embossed it in gold, then added the accent bar on either side and the martini cut with the coordinating die from the kit. Next I moved on to the fun dancer images in the kit, watercoloring with the NeoColor II Watercolor Crayons and then cutting with the coordinating dies from the main kit. I thought they looked perfect for this Dancing Music Notes Confetti Die add-on. I cut the die from white cardstock and then again from shiny gold, reserving the confetti pieces. I layered the white die cut panel over black cardstock and then inlaid a few of the gold confetti pieces randomly. I popped the dancers up on foam tape, then accented with some of the Art Deco mirror confetti included in the main kit. My images are colored with Copic markers and despite all my efforts, I didn't get things lined up quite perfectly when I stamped, so I just drew in the missing section of the girl's head. Then I layered down the fancy die from the kit cut from shiny gold paper and a white foam sheet. 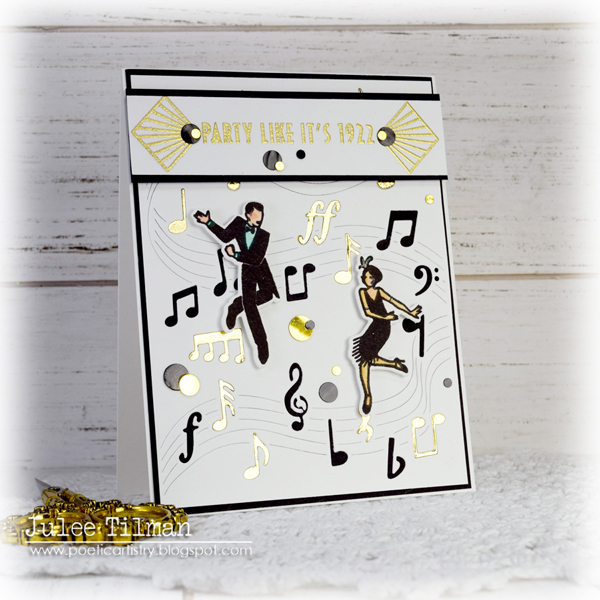 For the sentiment I used the beautiful Deco Celebrations set and embossed in gold, then cut with a circle die. 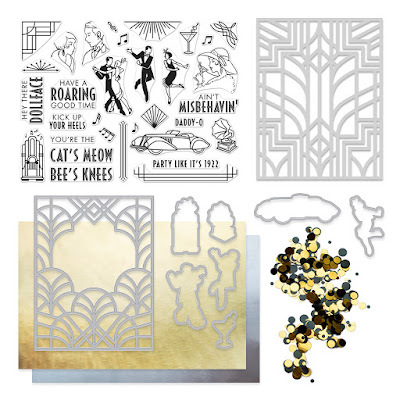 In addition to the stamps, dies and confetti, this month's kit also includes a fabulous stencil, big enough to cover an entire card front! I love me a stencil, so had to pull out the distress oxides again! My heart went pitter patter when I saw this fabulous butterfly in the Deco-rations set. My new favorite thing to do has been to stamp the image in intense black in my MISTI, then stamp again with Versamark ink and emboss with Sparkle embossing powder. I love the sparkle and you can then color with Copics like I did here, or whatever other medium you prefer. For the background, I taped down the stencil and blended with tumbled glass, salty ocean and blueprint sketch distress oxides. I had originally planned to orient the card the other way with the light section on top, blending down to a darker hue at the bottom. But when all was said and done I though the card looked more balanced vertically, so changed course mid-way. 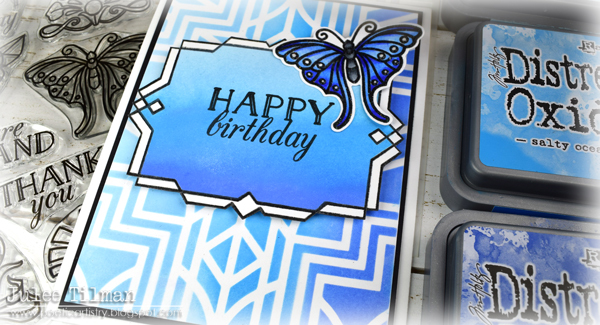 I embossed the frame from Deco Celebrations in black, then masket off the outer portion and ink blended the center. I then embossed the sentiment from Deco-rations in the center and fussy cut the frame to pop up on. The butterfly is cut with the coordinating Deco-rations Frame Cuts and adhered on one side only, allowing the other wing to pop up for more dimension. Okay, that's all for me today. I hope you've enjoyed my makes from this fabulous release. If you're a kit subscriber, remember you can order any of this month's lovely add-ons to ship with your kit with no additional shipping fees if you place your order before Thursday. All of the add-ons are added to the Hero Arts catalog and restocked. The kit is only available while supplies last, so grab yours while you can! 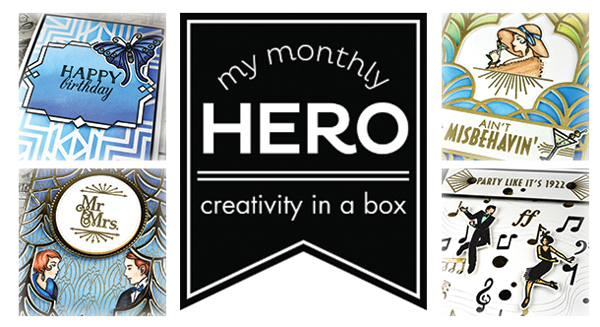 Here's a closer look at the February My Monthly Hero kit. I've also linked the entire release along with the supplies I used for these cards below for your convenience. For a chance to win the giveaway of this month's kit, leave some comments for the talented designers linked below. Here's the full hop list. Happy hopping! Laurie Willison 👌 Next stop! Wow, so many great ideas. Love all the different materials you used. Love the Ain’t Misbehavin! Your colour techniques work fantastic, just stunning! Fun idea!! Absolutely beautiful kit! I enjoy all your projects! Oh, My! What fab colors! and how cool to turn it for the Mr & Mrs... I love how they fit in there!! I was wavering, now I'm sold! Gotta have this!! Thanks for showing the dancing music coverplate, too, I love how it looks! I love ain't misbehaving too! Your watercolors are awesome! All your projects are amazing, Julee, but the ink blending makes my heart sing! TFS! Your backgrounds are awesome! I have to try! Thanks for sharing! Oh wow! Those backgrounds just pop! Your colors look INCREDIBLE. I just love it!!!!!!!!!!!! Amazing cards! Really lovin' the art deco designs. I'm with you! Ain't misbehaving - I want it all! My favorite card is the black and white one with the little hints of color on the dancers. I also love the gold music notes. The white background it really striking! Very pretty cards. Great show showcasing the new kit! Thank you for sharing your talent!! Your designs are spectacular and really bring these products to life. Love all the geometric styles and the way you framed the characters on your third card. Thanks for sharing your creativity. Beautiful cards!! I love the ombre background on your first 'apple-tini' card. Scrumptious!! I just love your cards. The colors and backgrounds are great. Your cards are very nice with the colors on them. I also like that music background with partial inlaid gold accents, great idea. Such wonderful cards! Great kit! Fabulous cards! Love the art deco look, love the colors. I love all the colors, sometime we forget how colorful that era was, thanks for showing how wonderful it was. WOW Gorgeous cards!! Your backgrounds are stunning!! These are gorgeous, with all of the bright and beautiful colors you used! Fabulous work showing off the release. Oh my gosh are those fun cards or what?! Love Art Deco! love, love your caards and you did awesome on the fur coat on the first card!!!! shelooks like shes wearing real fur!!!! Four cards! Love all of these. You amaze me! Thank you for sharing. Truely art deco cards - amazing! Love them all and this HA kit! I really love your color choices and how you blended the colors together. The musical one makes perferct for a party invitation. ALL your cards are gorgeous. The colors are stunning! I love the birthday cards. They can be used for either male or female. Need lots of male card ideas. Gorgeous!!! Fantastic cards Julee, everyone is so unique. I love your mix of colours, so soft & pretty. Thank you for sharing. Gorgeous! Love the colored backgrounds, and the negative image background! All of your cards are fabulous, just like this kit. 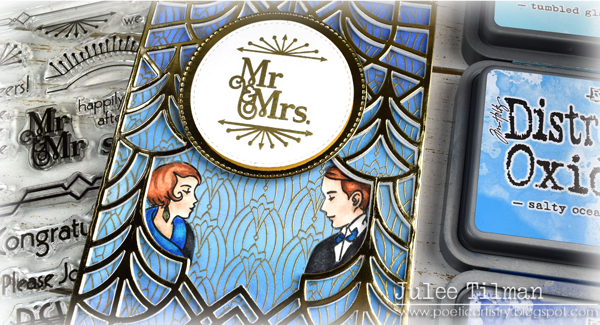 I especially like the Mr & Mrs card, the way they fit into the curve of the die cut. Thanks for the great inspiration! Your cards are so beautiful, can’t wait to get my kit. Very nice cards! I love the dancers! The music note background with the dancers is definitely my favorite from this set of cards but it was hard to choose since they're all quite beautiful. Beautiful cards! 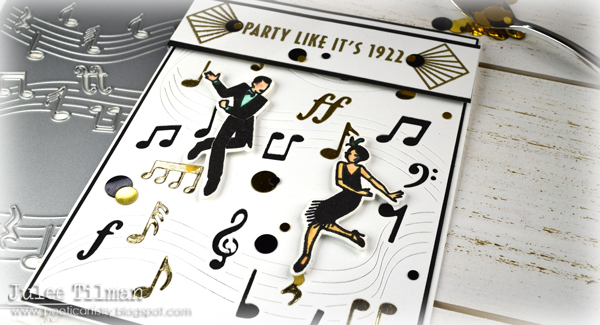 I love the party like it's 1922 card - gorgeous! wonderful array of cards, Julee - love the fun colors you chose! I just LOVE this kit and your cards are BEAUTIFUL! I need this kit.....LOL! Love all of your beautiful cards. This is a great kit and you used it beautifully. Lovely cards and ideas. Appreciate your ideas. Oh my goodness you crafted some amazingly beautiful cards for the hop! So classy your creations! So loving this new stuff! I can't wait to get my hands on this release and do the same! Thanks for sharing! Love the way you added color to your cards - your cards are beautiful. Wow - wonderful cards! 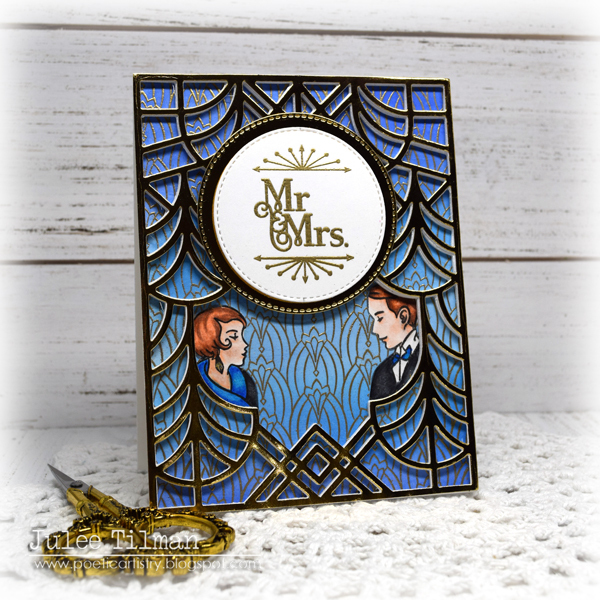 I love the use of colour and pattern behind the deco die cuts - they are gorgeous on their own, but the addition of rich colour and pattern that complement them just adds even more oomph! Amazing cards! Thanks for sharing your "mistake" - but the card turned out so well! What gorgeous cards! I love all the different ideas. Beautiful cards! Love the Art Deco style. Absolutely love your cards! Gorgeous! This HA kit is awesome. TFS!! Great ideas! Love the vibrant backgrounds. Your cards are amazing and the Art Deco design is so appealing. Love the cool ombré backgrounds! So pretty. what a great shaker card! The dancing card is fun. These are very pretty. I love the blues. It's a lovely change from all the black and gold that I've seen. It gives a new look to these products. My favorite is last one. That stencil looks great. I love that frame and the butterfly is lovely. Thanks for sharing your great ideas. Hi Julee! I love your cards. The blues are so exciting; this kit is so exciting. I love what all of the artists have created with the kit but the last few blog stops have been rich in color and I just love that! Thanks so much for your inspirational cards and and also for showing me a way to use the music frame cut die. It really didn't spark a light in me until I saw how you used it. Best to you and all of the team! Gorgeous cards! I love that you used different colors. There is so much that can be done with this kit - I love it! Thanks for the inspiration! I like your creative and colorful card designs. I am excited about the potential this kit offers to make cards for so many occasions. Inspiring! 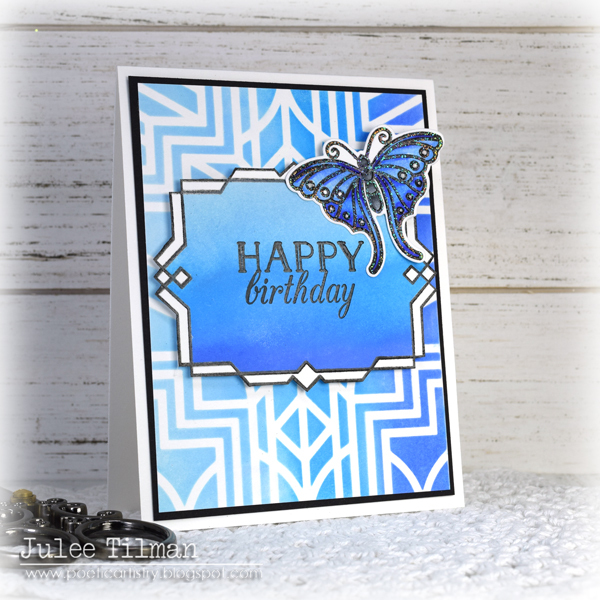 I love the blue tones in all your cards! All of your cards are beautiful. Such brilliant colors! I had been wondering the same thing about the heads of the stamp! 😂 Thanks for coming up with a reason. Gorgeous, vibrant, playful and energetic cards! Fantastic! Wonderful cards, Julee! I love the gorgeous colours you have used on your cards! So bright and happy! Thanks so much for sharing your wonderful inspiration! Amazing cards - the designs and colors are Wonderful! Thanks for all the super inspiration for using this great kit! I love, love, love your cards. I adore the colored backgrounds! Your second card is so fun!